Some twenty years later, in an important overview of African ideophones, G. Tucker Childs also noted that ‘the absence of ideophones in Khoisan is another puzzling area’ (Childs 1994:179). Since then, however, there have been a few reports of ideophones in Khoisan. Childs (2003) revised his 1994 statements, citing Nama and Kxoe (both spoken in Namibia) as Khoisan languages in which ideophones were attested. Indeed, Kilian-Hatz (2001), in an article comparing ideophones from Baka (Niger-Congo, Cameroon) and Kxoe, attributes the claim not so much to a lack of ideophones in Khoisan, but rather to a general lack of data on Khoisan. Still, the previous reports (often based on personal communication with Khoisanists) do cast something of a shadow of doubt over the issue. Okay, so some Khoisan languages might not have a class of words that perfectly maps onto the category of ideophones in neighbouring Bantu languages. But surely they have their own expressive resources — linguistic structures that are used to convey or evoke sensory perceptions, sensations, and inner feelings. What do these look like? One particulary nice dataset comes from G|ui, a language of the central Kalahari desert sporting an impressive amount of food texture verbs. The data comes from a talk4 by Hirosi Nakagawa at ALT VII in Paris last year. 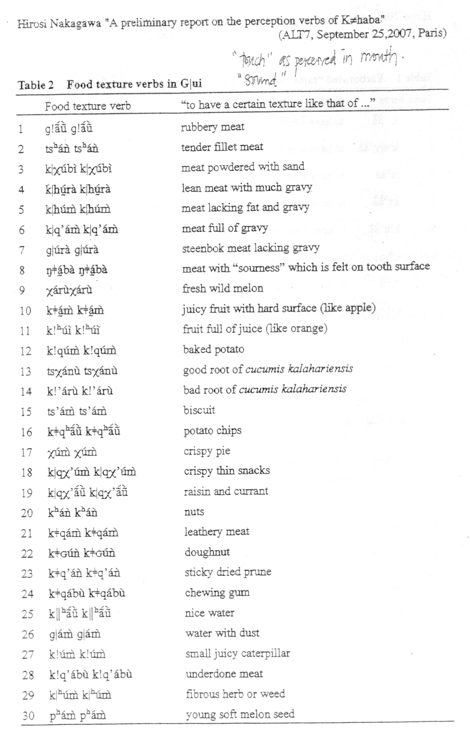 Rarely does one get linguistic data that is so mouth-watering. The food texture verbs above evoke an amazing number of different in-mouth perceptions. Their semantics is very detailed, including not just tactile information but also sound, and often an evaluative dimension too. It thus seems these words package information from different sensory modalities; in other words, they function to evoke a sensation as a whole rather than picking out aspects of it. A striking characteristic is furthermore the full reduplication, which presumably adds a sense of iterativity or distributedness to the event. We can also identify some sound-symbolic clusters (closely related forms mapping onto closely related meanings). Compare k!qúm̀ k!qúm̀ ‘texture of baked potatoes’, χúm̀ χúm̀ ‘texture of crispy pie’, and k|qχúm k|q̀χúm̀ ‘texture of crispy thin snacks’; or k!q’ábù k!q’ábù ‘underdone meat’ and kǂqábù kǂqábù ‘chewing gum’. In the light of this data, it is worth thinking more carefully about what it might mean for a language to ‘have no ideophones’. Presumably, what the Khoisan-related claims mean is that there may be no unified, large class of expressive vocabulary like in Bantu.5 This might just be the case (though we don’t know for G|ui, and we have seen above that the claim is controversial). If it is so, it need not surprise us, for it is well known that languages differ in the extent to which they systematize and emphasize their expressive resources. Indeed, how do languages go about systematizing their expressive resources? How does ideophony come about? What sort of societal features nurture ideophony, or inhibit it? I would argue that these issues are more urgent than the question whether or not a language can be said to have ideophones according to some essentially arbitrary measure. To really understand ideophony, we need to look at expressive vocabulary in all its guises. It has never been claimed that Berber languages are ideophonic, as far as I know — yet the expressive verbs of Tuareg share many properties with words that have been called ideophones in other African languages; and they help us to get a grip on the phenomenon of expressivity in language. The food texture verbs of G|ui present a similar case. They demonstrate that the G|úi-kò, hunter-gatherers from the central Kalahari desert, care about making fine-grained distinctions in talking about in-mouth perceptions of food. This may be related not only to the sheer amount of different foods they eat — ‘people eat more than 80 species of plants and 40 species of animals’ (Tanaka 1996:16) — but also to the enormous significance of food in the harsh semi-desert environment of the G|úi-kò: ‘food resources are basically consumed the day they are acquired, in a hand-to-mouth kind of existence’ (ibid., 14).6 In a society where food is so intimately tied to existence, it is no wonder that people like to share the sensations related to eating it. The G|úi-kò form a small-scale society living in close connection to the natural world. Tanaka notes that ‘[t]hey do not distinguish the animal world as cut off from their human world. It may be said that such an attitude is granted for the people who live enmeshed in the wilderness and are naturalists in the sense that they are an integral part of nature’ (ibid., 27). It has been noted by several authors (e.g. Westermann 1937; Nuckolls 2004) that such circumstances seem to favour the development of ideophony. Whether you call them ideophones or not, the food texture verbs of G|ui form another vital piece of the puzzle of expressivity in language. Childs, G Tucker. 1994. African Ideophones. In Sound Symbolism, Ed. Leanne Hinton, Johanna Nichols, and John J. Ohala, Cambridge: Cambridge University Press. Childs, G. Tucker. 2003. An Introduction to African Languages. Amsterdam: John Benjamins. Heine, Bernd, and Zelealem Leyew. 2007. Is Africa a linguistic area? In A Linguistic Geography of Africa, 15-35, Cambridge: Cambridge University Press. Meeussen, A. E. 1975. Possible Linguistic Africanisms. Language Sciences 35:1-5. Nakagawa, Hirosi. 1996. An Outline of |Gui Phonology. African study monographs. Supplementary issue 22:101-124. Nakagawa, Hirosi. 2007. A preliminary report on the perception verbs of Kǂʰábá. Talk presented at ALT VII, Paris, September 25, 2007. Nuckolls, Janis B. 2004. To be or to be not ideophonically impoverished. In Proceedings of the Eleventh Annual Symposium about Language and Society — Austin, Texas Linguistic Forum, 131-142, Austin. Samarin, W. J. 1971. Survey of Bantu ideophones. African Language Studies 12:130-168. Tanaka, Jiro. 1996. The World of Animals Viewed by the San Hunter-Gatherers in Kalahari. African study monographs. Supplementary issue 22:11-28. Westermann, Diedrich Hermann. 1937. Laut und Sinn in einigen westafrikanischen Sudan-Sprachen. Archiv für vergleichende Phonetik 1:154-172, 193-211. N.B. This is the first post on The Ideophone with a ‘smart bibliography’ using COinS. If you use Zotero, the references above are just two clicks away from your library. Pretty cool, huh? This entry was posted in African languages, Ideophones, Sound symbolism by mark. Bookmark the permalink. Kwarandzie isn’t big on taste vocabulary, but I found myself reminded of qezqez “taste like unripe dates” (which leave a rather horrible feeling in your mouth). When I read your previous post on ideophony in Japanese I thought of Janice Nuckoll’s comments regarding the propensity of societies that are ‘close to nature’ to develop ideophones, and then, towards the end of this post, you indexed them yourself. Personally, I feel skeptical that the correlation is robust, but I’m curious what you think, since you have no doubt thought about these issues much more deeply than I have. I’ve worked in Amazonian societies that are very ‘close to nature’ whose languages exhibit relatively little ideophony, and I think it would be hard to describe the hyper-urban Japanese as being ‘close to nature’, despite the extensive ideophony that you discussed nicely in your previous post. I also find it hard to understand how, precisely, being ‘close to nature’, however one chooses to operationalize the notion, would give rise to ideophony. What is the link? At root, might the hypothesized correlation be — to put it somewhat provocatively — anything more than a whitewashed and updated conception of the bogus correlation once seen between ‘primitive societies’ and ‘primitive languages’, where ideophony is an index of ‘primitiveness’? Lev — great comment. I actually gave it away too early, as I’ve been working on a post comparing Westermann’s and Nuckoll’s views on the issue (which are surprisingly similar, I’d say). As for ideophony as a primitiveness index, I agree that there is a certain danger there, but I don’t think it necessarily applies to Nuckolls’ argument, which I find quite carefully phrased. See, that’s intriguing, and an interesting limiting case to be reckoned with in any theory of ideophony. But certainly you overlooked the food texture verbs, on which I just prepared a follow-up posting. Just kidding. Only half kidding, though — it would be interesting to know how and to what extent the languages you mention cultivate their expressive resources. What about landscape vocabulary? Visual patterns? Manners of movement? Inner feelings and sensations? What about narratives — how involved is the audience, and what kind of techniques are used by narrators to get them involved? And moving beyond the verbal domain: what about gestures? Thanks for your insightful response. I look forward to your post comparing Westermann and Nuckolls. And good luck, btw, on your upcoming fieldwork! You were quite right to correct my crude representation of Nuckolls’ position, but at the end of the day I think we are still left with a hypothesis that connects a society’s relationship with nature – be it philosophical, ideological, or material (or all three!) – with the occurrence of ideophones in language spoken in that society. There may very well be a plausible mechanism connecting the two phenomena, but I still have a hard time seeing what that might be. My personal hunch is that the use of ideophones, and their systematization, has probably more to do with language ideologies regarding the role of mimesis in discourse. Even in Western societies, children use ideophones in play (Blam blam! Kaboom! etc. ), and informal interactions are frequently rich in other expressive resources. But in more formal interactions, I believe, the skilled selection of lexical items is valued over the deployment of expressive resources like ideophones. (As a though experiment, imagine a political leader of a Western society employing an ideophone in a political address.) I suspect that speakers in a given society associate the use of mimesis with certain kinds of social positions and interactional stances, and that it is the value placed on these positions and stances by speakers that affect the use of mimesis and its subsequent elaboration into resources like ideophones. As you suggest, many different factors could feed into this. Your suggestion that I look at other expressive resources is well-taken, and its worth mentioning that in Nanti, one of the languages I am working with, there is significant elaboration of prosodic features to express a wide range of affective and interactional stances. In fact, my partner, Chris Beier, is writing her dissertation on this very topic, and she has uncovered some very subtle and interesting ways in which prosodic features encode stances. You two should talk! Lev, I’ve been slow in replying because I’m on a fieldtrip now — but I highly appreciate your perceptive comments and the issues you raise have been on my mind a lot lately. More later! Hi again. I’ve looked at sound symbolism in a couple of Khoisan languages. Not ideophonic per se, but verbal. But then Bantu ideophones freely intermingle with verbs anyway (especially in Southern Bantu). Many of the terms that were either borrowed from or modeled on Khoisan neighbors (say into Zulu, as click-initial forms) deal with material textures and various ways of interacting with these. In the Khoisan I’ve examined, many of the forms that end in -m, glottalized -m, nasalized -o or -u have something to do with eating. Interestingly, so do verbs beginning with the rare labial clicks. In languages like Mongolian, where one can have CVC-C ideophone stems, the phonosemantics of the third C seems identical to that of the first (while the second is opposed). This third C can be any of the allowed phonemes. Perhaps then the final C in Khoisan verbs is similar this regard to the first, click-based one (though not a click itself).